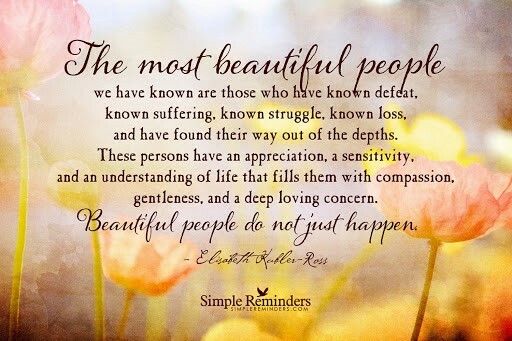 The message this week is very simple ladies and gentlemen…Beautiful people do not just happen. Take time right now to think of a hero you have in your life. There is no person of character or substance that did not weather several personal storms to continually transform into a better version of themselves. You do not have to search through history books to find women and men that didn’t know why they were given the struggles and trials they faced and overcame. You can probably look right in your family tree to see an example of beauty and grace under pressure which resulted in a wise mom, dad, grandmom, granddad, aunt, uncle, sister or brother. They were not born the pillars of strength and wisdom that stand before you today. They faced some of the same life challenges that you do and they had faith for the promise of another day. Have you ever noticed how much scarier a storm is at night than during the day? Most of the time the intensity of the storm is the same night or day, so what makes the night storm scarier…? That is right, the darkness. Your heroes also went through the dark storms at night and they were scary. They were not sure that they had it in them to survive. What did they all have in common? They believed in the hope of the “day” coming. Trials do not last forever, just like the storms in the night. There is always a day/transformation that is coming right behind this hard time. Even the bravest person you have ever known or read about went through that night storm and believed at some level in the promise of the light of day. Beautiful people do not just happen…they are created. They are created by the experiences of their pains, passions, life, and loss (just to name a few). You are a beautiful person and you did not just happen. You are choosing everyday to get up, out of bed and believe in the promise of a new day. One last thought on heroes…at the beginning of this post, I asked you to think of a hero in your life to help frame this discussion on how beautiful people don’t just happen. I am sure you were able to think of a family member, friend or historical figure without hesitation that resonates with the person you hope to be. I have several of my own, but none as important as myself. When these trials hit, and they will, you need to know that no one plays a bigger role as the heroine or hero in your life story than yourself. Only you will see this life till the end. I will close with the song that reminds me of this every time I hear it. This entry was posted in Character Development, Uncategorized and tagged #beauty, #beautyiscreated, #hero, #JLLB, #theconfidencepost. Bookmark the permalink.